Richard Bissell’s speech to the Massachusetts Legislature at the State House in Boston MA. The goal was to help legislators understand what families deal with on a daily basis. 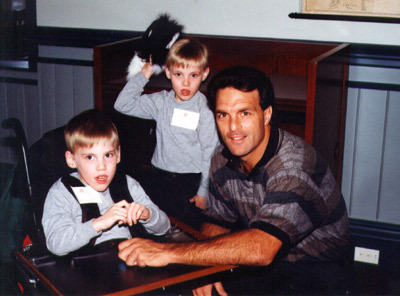 My name is Rich Bissell and I am the father of twin six-year old boys who have disabilities. In July of 1993, my wife Cindy gave birth to identical twin sons who were born 3-1/2 months too soon. Both boys had many of the problems common among premature infants. Eric’s most significant problem is spastic quadriplegic cerebral palsy. Aaron’s problems are mostly respiratory, he has bronchopulmonary dysplasia and subglottic stenosis. Aaron’s airway was damaged from the ventilator tube when he was in the Neonatal Intensive Care Unit (NICU). The ventilator certainly saved his life, but no medical procedure is done without the possibility of complications. 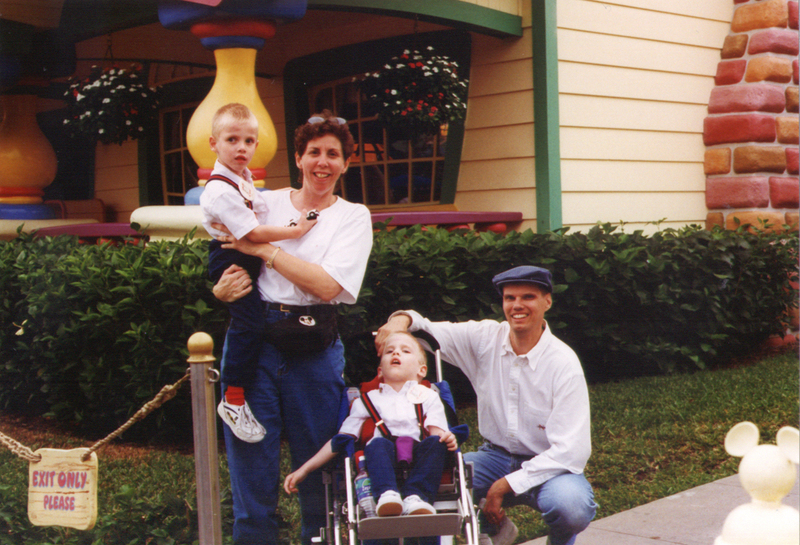 Aaron had his tracheotomy surgery at one month of age. His condition was complicated by bronchopulmunary dysplasia and he was oxygen dependent for several years. After three months in the Neonatal ICU, the boys finally came home. When I was thinking about what I was going to say today I looked back at my journal to see what life was like during those first few hectic years. I would like to share with you a small part of that journal. This is pretty much word for word the original journal entry made back in 1994. 1:00 AM – The perching alarm has been sounding for about a full minute before I am able to pull myself out of a dreamless sleep. I know it has been ringing because my wife has already managed to make her way to Aaron’s bedside and is in the process of checking his lead wires before I am even out of the bed. It is my turn to do the night shift and I have failed miserably in allowing her to get some much-needed sleep. “Sorry Hon,” is all I can manage as she is already making her way back to bed. The alarm is no longer ringing and Aaron is sleeping comfortably. One of his monitor lead wires had come loose and the apnea monitor was no longer getting a signal telling it that Aaron was breathing. 2:15 AM – I wake up to the incessant alarm of Aaron’s saturation monitor. I wipe the sleep groggily from my eyes and check the time. All of Grafton is in restful sleep and I am envious. It was only a few months ago that we brought our twin boys home from the hospital and neither Cindy nor I have gotten a full-nights sleep since. I quickly suction Aaron turn him on his side and go back to sleep. 3:25 AM – It feels like I have just gotten back to sleep when I hear Aaron’s “Darth Vader” like respirations. Whenever his secretions build up in his airway, his breathing gets noisier and noisier until he is suctioned, making him sound like a miniature replication of the Dark Knight from the popular Star Wars movies. I check his oxygen saturation; it’s 92 and falling. If I do not suction him soon the low saturation alarm will inevitably sound. I turn on the small night light next to his crib and look at this tiny miracle. He has put on a lot of weight over the last few months and is now up to a whopping 8 pounds. The heavy drone of the suction machine is a familiar sound and he does not stir. I clear the tube with normal saline and then suction just deep enough to clear his trach tube. He barely even stirs, having learned from birth that he would have lots of interruptions during the night. His sats crawl back up to 97; his color is good, his heart rate and respirations, normal. All is well. I take a moment to check on his brother Eric. Eric is sleeping restlessly and looks like he will soon be up. It’s been four hours since we last fed him, or was it Aaron who ate last. They look identical in every way when they sleep. I take a moment to write down the time and saturation level in Aaron’s log and then crawl back into bed. 4:30 AM – Eric is fussing and hungry. I hurry to him, before Aaron is woken by his cries. I quickly make my way to the kitchen and pop a previously prepared bottle into the microwave. As Eric eats, the constant beat of Aaron’s heart rate monitor reassures me that he is fine. Tomorrow will soon begin the continuing routine of medical equipment, therapies, medical bills, and a constant parade of therapists, nurses, and case managers, as well as the administration of medications, treatments, and feedings that fill our days from dawn till dusk. That, coupled with the many nights of broken and nonexistent sleep, and working full-time jobs, make for cranky coffee filled mornings at the Bissell house. But for now, Eric’s belly is full and he asleep. The constant hums and beeps of Aaron’s machines lull me back to sleep. My last thoughts are not of medical equipment, sleepless nights, or surgeries. The thoughts that send me to dream land are of two beautiful miracles that are sleeping in those cribs next to our bed. In the morning, when Eric and Aaron are looking up at me, my heart will fill with joy and pride. On the scale of life this joy easily tips the weight of all the sleepless nights and all the worry that I could ever imagine. Even after six years of sleepless nights I still feel that way. A few months ago my wife and I received a call from a family living in Springfield who had just brought home their three-month old daughter with a tracheostomy. Since their child has come home, they have had many sleepless nights, medical equipment problems, insurance difficulties, and cranky coffee filled mornings. I would like to be able to tell them that things are much better than they were six years ago and that there is a lot more support out there. But it is really not so. Many nursing agencies are short staffed and they are forced to either cut back or go out of business. A family who needs 8 – 16 hours a day of skilled nursing are lucky to get any. For families who need a PCA or personal care attendant the situation is even worse. Nursing agencies are forced to compete with McDonalds for staff that have the responsibility of caring for our children. Most of us would agree that children belong at home with their parents. A parent of a medically involved or disabled child has the same love for that child as the parent of a typical child does. In order to live at home many of these children require a certain level of specialized care. It is my hope that we can work toward a goal of allowing all children to have the best possible support in their own homes. I want to thank all of you for coming out today and hearing our stories. 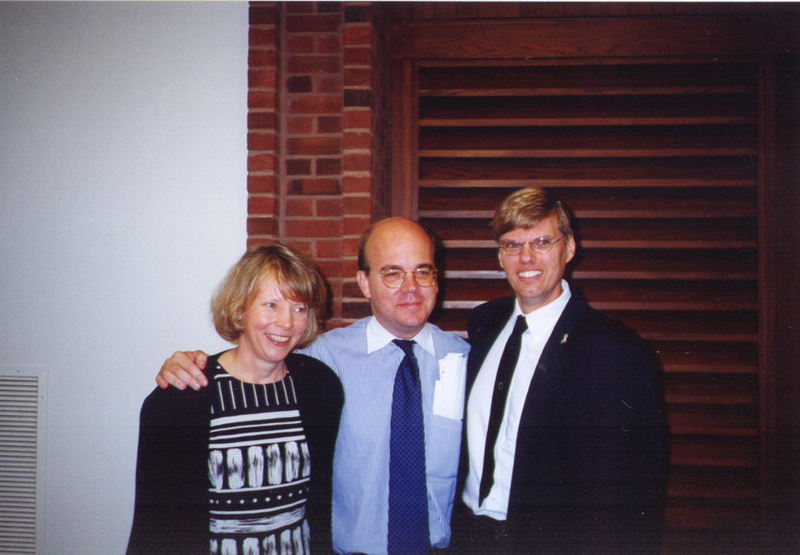 Diane Enochs, Area Director, Central Region DMR, Congressman Jim McGovern, Rich Bissell, Regional coordinator, Families Organizing for Change. “Congressman McGovern has been a long time advocate of individuals with disabilities and their families, this forum is just another way for him to get out and meet the people he is representing.” This is how Rich Bissell, Regional Coordinator for Families Organizing for Change sums up the recent community forum that McGovern attended in Shrewsbury. 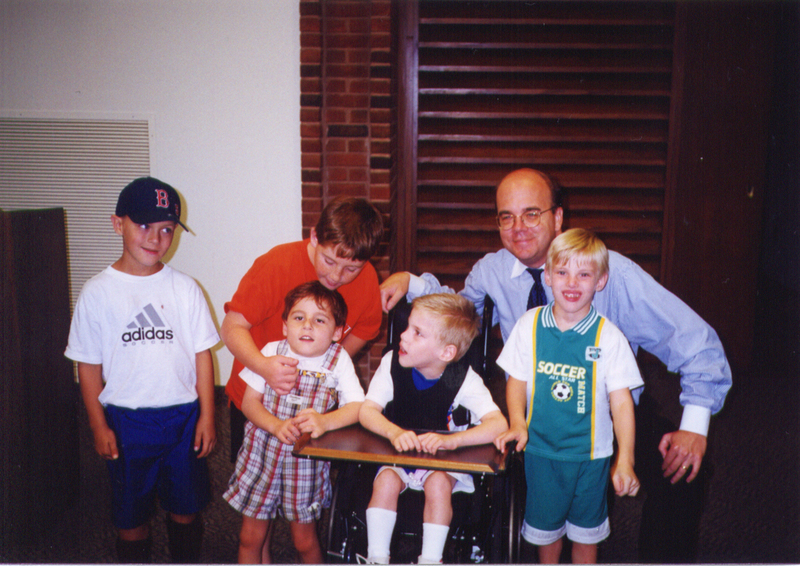 After visiting with two Central Mass families in their homes, McGovern met with over 100 individuals with disabilities and their families. Representatives from the Department of Mental Retardation, Matson Community Services, and the Seven Hills Foundation were also in attendance. McGovern spoke on issues of health care, education and social security before taking a series of questions from those in attendance. The local advocacy group “Central Massachusetts Families Organizing for Change” of which Bissell, a Grafton resident heads, coordinated the event. According to Bissell Families Organizing for Change is “a group of families and self advocates that have come together for mutual family support and advocacy in order to make life better for all individuals with disabilities.” Supported mainly by The Department of Mental Retardation, Families Organizing for Change provides advocacy training for families who care for a person with a disability. “Diane Enochs, (the DMR Area Director for the Central Region), has been tremendously supportive of FOC,” Bissell says, “ Without her support we would face a real uphill battle.” McGovern spoke about how “Government and Community must work together to ensure that individuals with disabilities are given opportunity and a chance to succeed.” He also spoke about “utilizing existing resources in creative and more effective ways.” “DMR seems to be taking a front seat when it comes to reaching out to the community. Supporting organizations such as FOC and Self Advocates Standing Strong (a Statewide group of individuals with disabilities) puts decision making power in the hands of the consumer, where it really belongs.” Stated Cindy Bissell, Mother of twin boys with disabilities and wife of Richard. Seventeen weeks into my pregnancy, an ultrasound revealed that our first “child” would be twins! Our excitement and anticipation were short-lived, however. Eric and Aaron were born at 26 weeks gestation–three and a half months too soon. Our lives as parents certainly got off to a rough start, as did the lives of our boys, who were immediately whisked off to the neonatal intensive care unit (NICU). When we finally got to visit them, it was difficult to see our babies among all the tubes and wires. They looked like tiny albino monkeys, covered with fine blond hair. The boys spent the next three months in the NICU, a stressful roller coaster ride that can be truly understood only by other parents of “preemies.” Both boys had many of the problems common to prematurity, including hypotension (abnormally low blood pressure), respiratory distress syndrome, intracranial hemorrhages (bleeding in or around the brain), retinopathy of prematurity (an eye disorder), patent ductus arteriosus (a condition in which oxygenated blood flows back into the lungs rather than circulating to the rest of the body), hyperbilirubinemia (jaundice) and anemia. Eric’s most serious problem was bilateral periventricular leukomalasia (PVL), a condition in which tissue around the brain’s ventricles (chambers in which cerebrospinal fluid is made and circulated) is damaged due to insufficient blood flow or lack of oxygen. Eric has spastic quadriplegic cerebral palsy as a result of his brain injury. Aaron needed a tracheostomy because of acquired subglottic stenosis (a narrowing of the area beneath the vocal cords and the opening between them), an unfortunate result of his earlier need for a breathing tube. Because of damage to his lungs and airways, he also had bronchopulmonary dysplasia, a chronic condition that would always affect his breathing. Aaron has more recently been diagnosed with asthma and attention deficit hyperactivity disorder (ADHD). The twins are now 5 years old and the trauma of the NICU has gradually faded. It is amazing to me where the twins have taken our family over the past 5 years. When the boys first came home from the hospital, I was often housebound caring for two sick, fragile infants. I turned to the Internet for information and support. My computer became my link to the outside world. I began building web pages as a way to network with other families and share our experiences. Since my husband Richard and I are both RNs, we had a bit of an advantage caring for sick babies. One of my web pages (Aaron’s Tracheostomy Page) has become the leading tracheostomy resource on the Internet. Networking with other parents around the world who are dealing with similar issues as our family was extremely therapeutic, and it not only helped us to work through our past experiences, it also is helping us face the many challenges ahead. Our home page is at www.bissells.com. The twins hectic schedules of therapies, doctors’ appointments and surgeries made it difficult to work a regular job. In December of 1996, I got an opportunity to work on an experimental grant project that has afforded me a more flexible schedule. The Family Health Support Project is a Department of Mental Retardation (DMR) / University of Massachusetts collaborative project in which family members and self-advocates have been hired as part of the medical team. I currently work in pediatric neurology at University of Massachusetts Memorial Health Care, were I help families advocate for their child with special needs and at the same time, help the medical teams understand the needs of families and foster family-centered care. Once the boys’ health issues began to stabilize, Richard and I were able to begin networking in our own community. 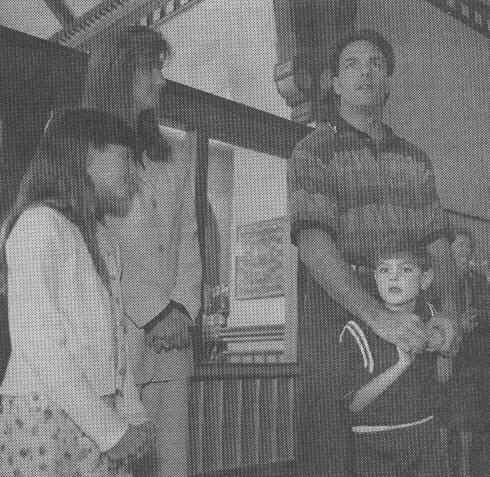 We attended our first Family Leadership Series in 1997. The Leadership Series is sponsored by Families Organizing for Change (FOC). FOC is a statewide, grassroots coalition of families with children and adults who have disabilities and/or chronic illness. The Leadership Series is a six-day series, which teaches families about leadership and advocacy. 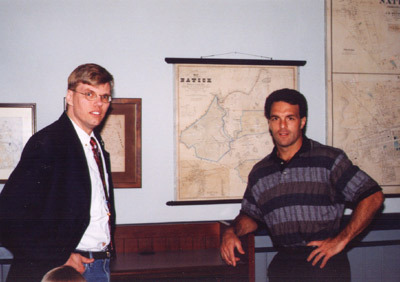 Now, two years later, Richard is the Regional Coordinator for Central Massachusetts FOC. We Have learned that “problems” are all a matter of perspective. In just 5 short years, the twins have completely changed our lives. We have changed careers, met new friends and we have become advocates for people with disabilities. We have also developed different philosophies and new perspectives. The twins have taught us about strength, endurance, patience, and about what is truly important in life. Richard and I are often asked how we manage, having two children with special needs. Well, we have learned that “problems” are all a matter of perspective. We discovered this back in the NICU when we were told that Eric had PVL and Aaron would need a tracheostomy. We were paralyzed with worry and fear, but gained some insight on our own situation by observing two other mothers. One woman was upset because one of her twins was temporarily under an oxygen hood; the other was despondent because one of her twins had died. All of us were grieving from different perspectives. We realized that although things could be better, they could also be much worse. Although he needed tube feeding, constant oxygen, treatment for seizures, and round-the-clock attention, Scotty Luce spent the last six years of his short life at home. 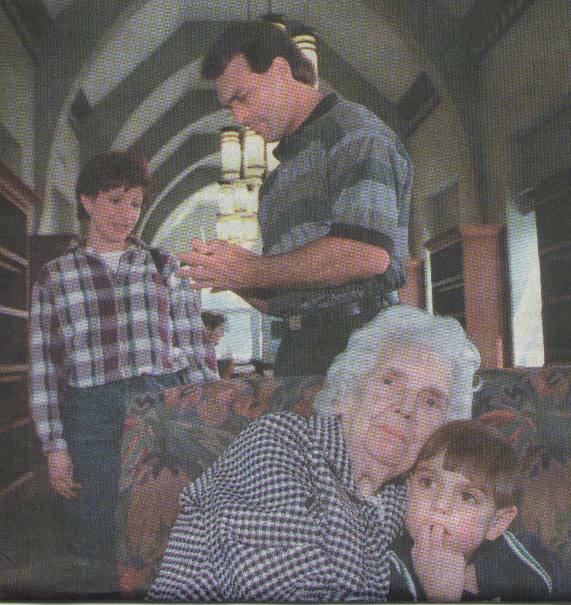 Scotty, who had a rare genetic condition that afflicted nearly every organ in his body, died in 1996. He made it only to age 12. He slept in a hospital bed and used a wheelchair; a line for nutrition led into his heart, and other tubes led to his stomach and intestines. He was cognitively impaired. Altogether, he was “medically fragile” — a description of infants and children so ill that they are living on the edge, and often only with high-tech life-support equipment. As more and more infants survive extreme prematurity or illnesses that would have killed them in the past, families are facing the question of caring for them after the immediate crisis passes. “There’s a lot of high technology that didn’t exist in the past, and so I think as a result of that, we have a new breed of children that exist in the World today,” says Patricia Luce, who lives in Worcester. She has founded an initiative called Family Partnerships, to assist families in pulling together the sometimes widely scattered resources needed for successful home care. Until fairly recently, children with chronic, severe conditions requiring expert care and specialized equipment “remained in hospitals and institutions, because there was no support for families or financial support to have the child go home,” says Dorothy Page, a family nurse practitioner who heads the pediatric homecare program of the University of Massachusetts Medical Center, in Worcester. She is also president of the National Association of Pediatric Home and Community Care, which she founded along with a UMass physician, Robert G. Zwerdling. The association is involved with education and research on home care of children and with setting standards. The move toward bringing medically fragile children home stems in part from activist parents who pressed public agencies to help make home care possible. Federal Medicare and federal-state Medicaid reimbursement policies swung toward home care as new technologies and training of parents made it not only possible but cheaper for these children to stay at home. The newly available money, in turn, prompted a home-care industry that had already grown up around geriatric needs to diversify into pediatrics. A broad range of medical conditions afflicts the infants and children who are being cared for at home. They include lung problems caused by prematurity or, sometimes, by the respiratory treatments for prematurity. Many of these children have tracheostomies — openings through the neck into the windpipe — through which they are connected to ventilators. The tracheostomies need constant attention. There are children with infections that demand long courses of intravenous antibiotics and young cancer patients on chemotherapy. Other children can’t eat, and they get all their nutrients through tubes. The care of such youngsters can be complex, demanding, and tiring, and the impact of the entire venture on the family is enormous. “The stress and disruption of your life is indescribable,” says Cynthia Bissell, mother of twin 4 1/2 year-old boys, Eric and Aaron, who were born 3 1/2 months premature and suffering multiple disabilities. Aaron had a tracheostomy and was on a ventilator until last summer to help him breathe. Today, the twins attend a special-needs preschool. Eric, who has cerebral palsy, uses a wheelchair, and Aaron is receiving therapy for his speech, which was delayed because of the tracheostomy. Even though Bissell and her husband are both nurses, she says they were initially intimidated by all the procedures they had to learn. “But you’d be amazed at how quickly parents become experts in their kids’ care,” the Grafton mother says. Like Luce and like other parents who make such a huge commitment, the Bissells believe the rewards of caring for medically fragile children at home are great. “We feel very strongly about this,” says Bissell, who has founded a group called Families Organizing for Change that is funded primarily through the state Department of Mental Retardation. The group is aimed at generating support for families caring for children at home. Besides DMR, other agencies involved in home care include the state Department of Public Health, Medicaid, the Massachusetts Commission on the Blind, and various private groups. Family Partnerships, in Worcester, can be reached at 508-756-7467. The National Association of Pediatric Home and Community Care, in Worcester, is at 508-856-1908. A World Wide Web site established by Cynthia Bissell offers information about caring for children’ with tracheostomies. It is called Aaron’s Tracheostomy Page, and the address is www.tracheostomy.com.